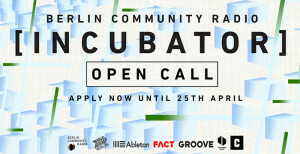 Berlin Community Radio announces a call for artists for its new BCR Incubator programme, open to applications until April 25. Aiming to “support Berlin-based emerging electronic music talents with a special focus on underrepresentedd and marginalised voices”, the programme will include a month-long BCR radio residency, music release, live performance, and Ableton Live 9 license and training, as well as studio time and an PR support. The jury will include BCR-founders Anastazja Moser and Sarah Miles, as well as Tabitha Thorlu-Bangura of London’s NTS Radio, Soraya Bouwier of Truants blog, Frankie Hutchinson of Discwoman, and producer and BCR presenter rRoxymore.